I’ve been in a bad habit of making quilt tops and tucking them away into the black hole that is my closet. My church was asking for quilt donations last week so it was good motivation to finish up some tops and give them new homes. This quilt is from my Heart Quilt Tutorial I wrote in January. There is also a tutorial here for making hearts in multiple sizes. I gave this one a quick quilt job with stippling in the middle and loopty loops around the borders. 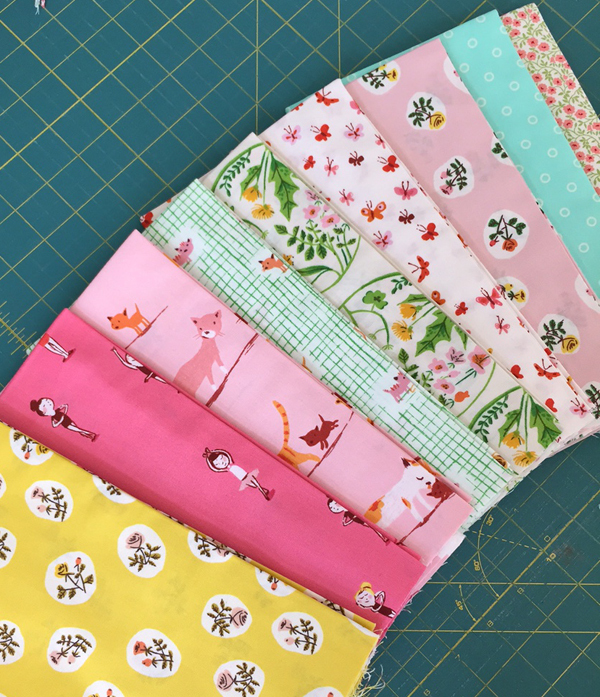 By the look of those borders I think I need some more practice with those…or maybe I need to slow down since I love to quilt fast! These are my latest fabric buys and I can’t bear to cut them up until I have the perfect plan. Most of these are from Tiger Lilly by Heather Ross in stores now, and the top two are from Hello Darling also in stores now. Love the heart quilt. It reminds me of those little heard candies with sayings on them at Valentine’s Day! Mmmm, I love it all!…esp. the heart quilt! Gorgeous per usual…. excited to get my new patterns in the mail! 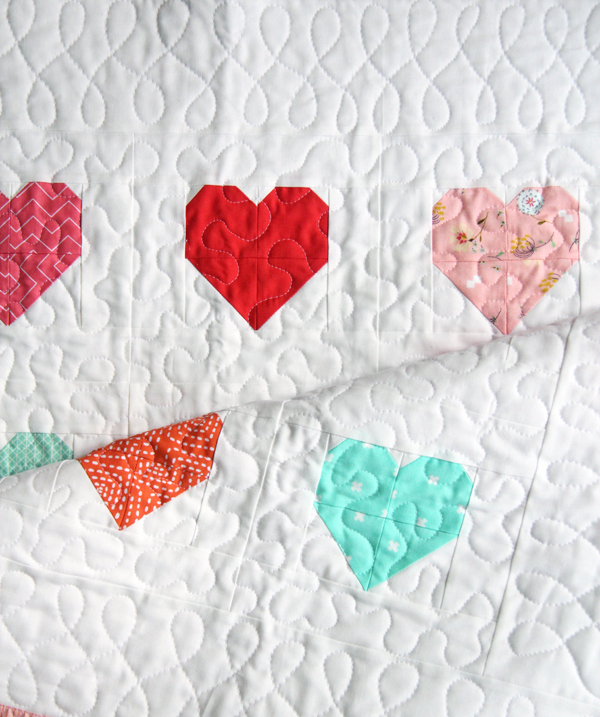 I love the colour palette of your hearts quilt! And what’s not to like about HR fabrics!? I like to quilt fast too! And loop seem to be my goto…could use some practice with different designs! 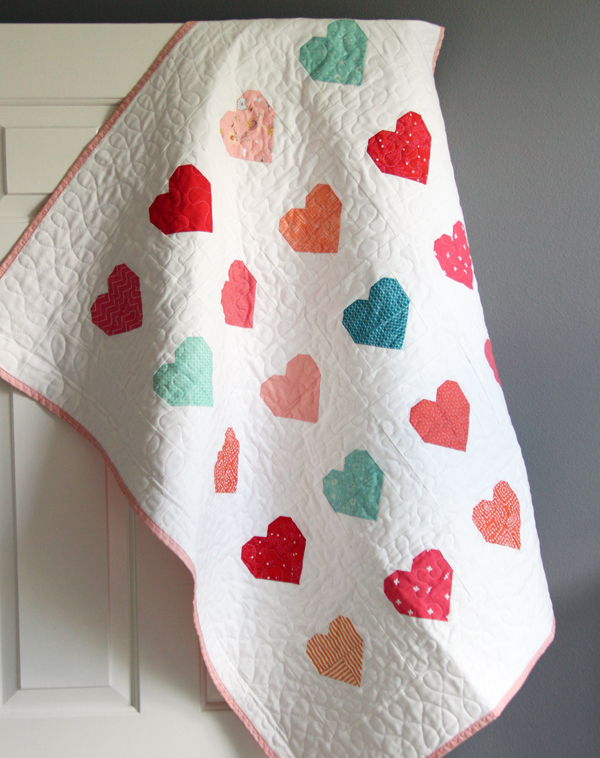 Your heart quilt is super cute and I am sure it will find a loving home! Looks great, looking forward to your creation with your new fabrics too! I absolutely love this pattern. I will try to make it soon!! The quilt is so cute. I love this new fabric by Heather Ross. I want all of it, especially the kitties. its so fresh and pretty! was your local ward/stake asking for donations or was that from headquarters? i’m interested to know! Wonderful quilts. I can’t wait to see what you do with your Tiger Lily bundle. I am holding on to mine, too. Waiting for the perfect plan.